Greetings everyone and I hope the changing of seasons has treated you well. Today, I would like to talk about a recent event that I partook in at Beaufort Books called Saturnalia. This Roman holiday, devoted to Saturn, when celebrated in ancient times, from December 17th-23rd, gave slaves the chance to become the masters for the day or for others to play games and enjoy themselves. It made me wonder if this is where people got the idea of job shadowing where students are given a day to learn more about the profession they’re passionate about. At Beaufort, I went from intern to managing editor for the day and I learned about the various roles and duties involved with the job. This was a fun and challenging experience as there are a lot of responsibilities involved. While I didn’t learn all of the tasks involved, I did learn about some important ones that are handy to be familiar with such as finances, responding to emails, and keeping the office organized. I think we all have an idea in our head as to what an editor does, I know I did before I started school and interning, but there’s a lot that goes on behind the scenes of making and producing books for all of us to read! 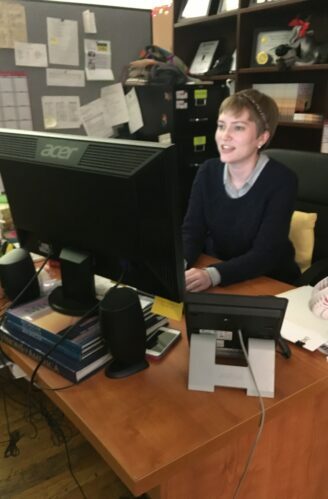 There are different types of editors found in an editorial department, and a managing editor is the one who oversees the others and keeps track of a book’s production. While I didn’t oversee anyone, I did get to help plot out the schedule for books that will be worked on in the coming year. I also learned about finances and how that fits into a managing editor’s duties. In my master’s program, I have taken classes that cover this side of the publishing industry, and it was refreshing to see firsthand how it works. There is something to be said about learning both inside and outside of the classroom! Overall, my time as a temporary managing editor ended smoothly. It showed me how everything I’m learning ties together and I now know what to expect in the future and I’m looking forward to it. Now, though, on my last day interning at Beaufort Books the future seems a bit nebulous. But I’m not too worried as I have learned a lot during my time at this internship and I will be forever grateful that I was able to wear many hats. It allowed me to see what sparks my interest and to help me better understand this fascinating industry. Take care everyone, and may 2018 have a wonderful plot twist waiting for you.